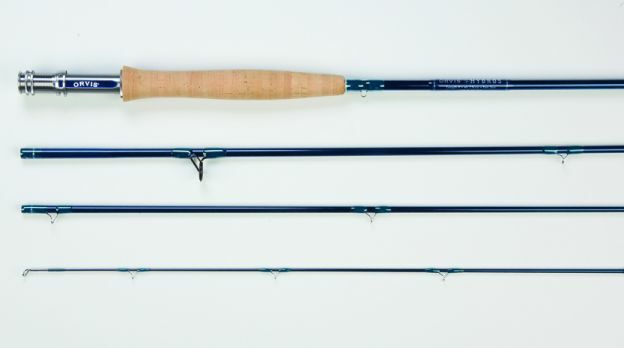 Orvis has just pulled the curtain up on their new lineup of rods for 2010: the Hydros (pictured). Perhaps sensing that the economy is not quite what it once was, the boys from Manchester have made a series of very good decisions to essentially bring the popular Helios into reach of the masses. The new rods will cost $495 for all freshwater models and $525 for all saltwater models. They are going to be available in every weight class that Helios comes in, with the exception of the switch rods. According to Orvis’ Tom Rosenbauer, they’re built on the exact same tapering and scrim technology as the Helios rods, with many of the exact same mandrels used as forms. How has Orvis managed to cut almost $200 off the price? By eliminating a lot of the Ferrari-level jewelry (bringing this baby more into the Cadillac class). The Hydros rods will not sport REC’s Recoil guides (the flexible, bounce-back ones), nor will they have as light a reel seat. The male ends of the ferrules are unpainted (actually a feature, not a bug–unpainted ferrules seat more securely). The rods will come with a traditional Cordura-covered tube rather than a woven graphite model. Due to the hardware changes, the rods will be slightly heavier–more akin to the premium models offered by other companies. Interestingly, they will be available October 15; well in time for Christmas. In short, to offer a little editorial, this is still a premium rod. Orvis seems to be filling in a gap in their lineup, offering a $500-class rod with very similar hardware to that offered by other companies, but building on what they believe to be a great blank design (and from what I’ve heard about Helios sales, the market certainly agrees on that blank). All in all this is a very intelligent move; rather than pushing the price envelope ever further, they are consolidating technological advances and putting more rods in more hands. Have an opinion about The Big O? Love the new Hydros? Hate it gently? Let us know in the Comments section!